Fast-casual restaurants are the bridge between fast food and full table service restaurants. These days options in The Loop are much more exciting than in years past. Finally, there are more unique offerings where one can sit down for a quick meal or pick up food to go without sacrificing quality instead of the usual chains. Here’s a list of my ten favorites to visit when looking for a quick bite in the middle of the workday or when in need of refueling while shopping. Gayles was recently ranked in the top 20 of grilled cheese sandwiches in the country by the New York Post. The grilled cheese is simply amazing! 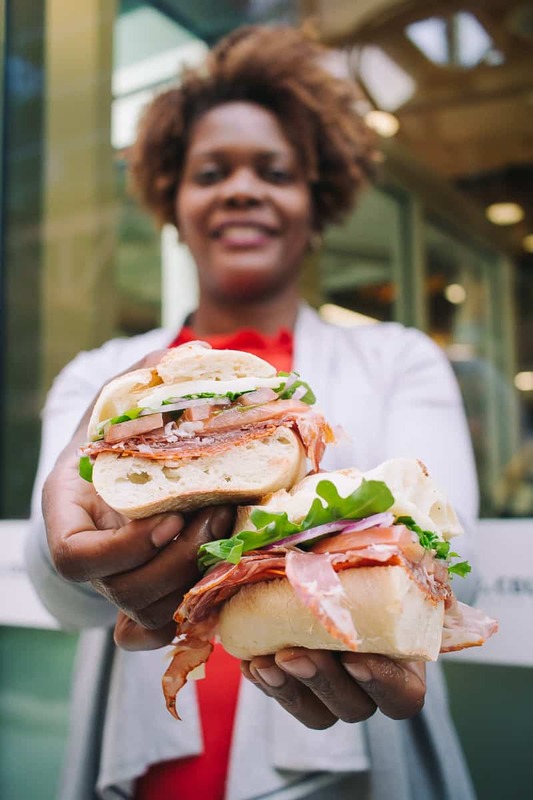 She uses freshly baked sourdough bread and sources fresh locally made cheese, butter, meats, jams, and vegetables for her sandwiches. Trust me; you can taste the difference! You can find Gayles Best Ever in Block 37 in the Pedway Monday-Friday 7:00-6:00 p.m. I only recently discovered Boar’s Head Cafe even though it’s only a few blocks from my office and has been open for two years. Boar’s Head, a family-owned company, has been in business for 110 years! Plainly stated, they believe in high service and high-quality ingredients without the use of fillers or msg. Two local Chicagoans own the café in The Loop. The sandwiches are made fresh and packed with flavor. Everything in here screams quality, from the gluten-free kettle chips to the locally made, all natural cookies. I was majorly impressed with how clean the restaurant is; I mean it’s pristine! Food is much more enjoyable in a clean environment. Hang out for a while or grab n go. This place is excellent, get in there already! Monday-Friday 6:30-6:00 p.m.
3. Roti Modern Mediterranean, 80 E. Lake St.
Roti’s purpose is ‘ to serve food that loves you back,’ it’s nice to have healthier fast-casual options in The Loop! Roti sources the best ingredients and prepares them straightforward so that all of the tastes come through. They practice sustainable sourcing. Their chicken is antibiotic free, their beef is grass-fed, and their salmon is always fresh, never frozen, and filleted by hand in the mornings. The lamb meatballs are the bomb! Open Daily 11-9 p.m. weekdays and 11-8 p.m. weekends. 4. BienMeSabe: 29 E. Adams St.
5. Sweetgreen: 1 N. Dearborn St.
Uncomplicated, seasonal, healthy food is what Sweetgreen is all about. It’s probably my favorite fast-casual place for salads near the office. I love the premium options offered, not many fast-casual places where I can get shrimp on my salad. Sweetgreen is the place to go when you want to know exactly where your food came from. This place gets pretty crowded, I usually order through the Sweetgreen APP and grab n go. Monday-Friday 10:30-8:00 p.m.
6. Revival Food Hall: 125 S. CLARK ST.
Revival Food Hall is your fast-casual fantasy; a massive, 24,000 square foot gourmet food hall that’s sure to overwhelm you with choices on your first visit. I can’t even begin to convey the excitement I felt when this spot opened in 2016! It features 15 fast-casual stalls of Chicago restaurants in a grab-and-go setting. It’s perfect for groups of picky eaters. My co-workers and I don’t always agree on where to lunch; Revival makes us all happy. Options include Nashville hot chicken, Detroit style pizza, Ramen, seafood from Brown Bag Seafood, desserts from Mindy’s Hot Chocolate and much more! Open Monday-Friday 7-7PM, Bar open til 9 p.m.
7. Frontera Fresca: Macy’s 7 on State, 111 N. State St.
Frontera Fresca dishes fresh gourmet Mexican food. The quick-service restaurant, located on the 7th floor of Macy’s on State St is the creation of acclaimed chef Rick Bayless. Hungry customers can choose from tortas, tacos, soups, salads and a fresh-made guacamole bar with a choice of toppings. Monday-Saturday 11 a.m to 3 p.m.
Halal Guys began as a hot dog cart in New York City and expanded into 2 NYC restaurants. Chicago is the first market outside of New York to experience Halal. The menu is simple. Halal certified beef and chicken, and basmati rice with special spices. Every day their chicken is seasoned with spices, marinated for 24 hours, and grilled. Their gyro meat is cooked on a cone, sliced, chopped fine, and then grilled to a golden brown. Customers can choose from either a sandwich or a platter, select their protein, and pack with toppings of choice. There are also 3 sauces to choose from including their famous white sauce! I tried to get the scoop on their seasonings but their lips were sealed. Halal Guys is open daily from 11-10 p.m.
10.Brightwok: 21 E. Adams St.
A newer addition to the Loop, Brightwok is a healthy, fast-casual, Asian restaurant that’s vegetable-focused. The restaurant marinates and grills their meats, prepare and mix sauces, and chop their vegetables every morning to deliver the freshest flavors. I usually go for the build-your-own bowl of stir-fry with a bit of heat. Their menu is gluten-free, dairy-free, peanut-free and all of their homemade sauces are vegan. There you have it, don’t sleep on these spots!